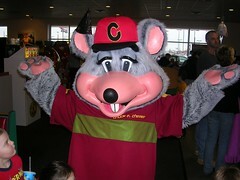 Let me start by saying this: if you are anything like high school students, the one thing that you will probably remember about this blog is that I once held a job as Chuck E. Cheese. Yes, as in, the giant mouse in the horror-filled, horrendous, er, extremely stimulating children’s pizzeria, that happens to serve more beer to adults than it does pizza to children. The idea of having to stand in front of a group of high schoolers and pretend I have a fascinating enough existence (did I tell you I am learning to knit? Or that my goal is to finish the New York Times crossword puzzle in a day? Or that the bane of my social existence is book club?) was nothing short of mortifying. And yet, as the senior correspondent (mostly retired) of our community newspaper, I felt that obligation to agree. And so I did. Student: “What was one of the strangest stories you ever had to write? Me: “Well, there was this one family who adopted a pig and actually kept it in their house as a pet, and we did a story on it—it even wore a bow for its front page photograph—and a year or so later, someone hit the pig with their car, and I had to go do a pig obituary for it (laugh). Ah, the beauty of living in a small community. While I’m sure my face suddenly matched the color of my hair (which is red), I did have a bit of an epiphany at that moment about exactly I should be talking about: community. Each question they asked about my job, my volunteer work, my family, all began to echo back to that one word. I began to ramble, and they began to furiously scribble notes—or doodles, but I’m pretending notes for the sake of my pride—as I spoke to the joy of working at a small, family-owned weekly newspaper in northern Michigan. Each story I have written is like the squares of a quilt; the personal profiles ranging from the summer resident who was in the Pentagon on a blue sky September day that changed everything to the middle school girl who broke barriers playing football, just because someone told her she couldn’t; the political fights and dogged determinism of those working to protect what is sacred about our sense of history, place, and open space; the hope woven into the missions of the many non-profits that call northern Michigan home. This quilt is what I have come to wrap my family into for safety, warmth, and love. The Harbor Light Newspaper is owned by a family—one that lives just up the street from our office—and the dedication to communicating to neighbors needs, issues, and stories that make up who we are, runs as thick as the black coffee brewed there each morning. When I joined the paper, I did so because the “family first” motto rang true to my heart. I stayed because their family became my own. We broke bread together, went through pregnancy and births, rallied and worried about various town causes, celebrated the passing of the seasons with subscribers’ summer and winter address changes and with an eye on the past and a pen on the future. For me, and so many others, that paper has become the heartbeat of the community. And as I spoke, I wondered if these children—if my own children—know how amazing it is to be part of the words, the sentences, the moments, that are northern Michigan. I felt the emotions swell—perhaps because I was realizing for the first time just how much it means to live in a place still rooted in local business, still small enough to care about the little things, say, for example, dead pet pigs. Ahem. We read that paper whenever we come to town. It is true that there is something special about a small town press– in an age of big corporations, it is nice for communities to still have their own voice. Hilarious! You have to love the zero-degrees of separation in a small town!!! wonderful post! there is something magical about a small town, especially Harbor Springs. with the sense of community you are instilling in your children, i’m sure they will appreciate that special feeling of a small town. It may take them venturing out of Northern Michigan for them to realize this, but their home town will always be a special place for them. It was great to read your three articles in this weeks Harbor Light, the one on the rug works in Cross Village certainly shows that sense of Community. How well you captured the essence of The Harbor Light and it’s owners. It’s so fortunate to live in a small town with a paper and people who care about the community. The readers have long loved your entries. The students who listened to you had to have left with a smile and something to aspire to become. Thank you for sharing your views. You say what we, in the small town, all feel! I love this picture of you, Kate. I so want to be on the other side of the table from you talking about community – and 4-year-olds throwing up (oh dear, hope he is better), among other things. Also, I am obsessed with crossword puzzles. I’m about a Wednesday in the NYT – I mean, Wednesday is nice and challenging and I can’t finish without checking the answers. So what I want to know is do you get the NYT as well as the HArbor Light, and if so how in the world do you find time to read it? 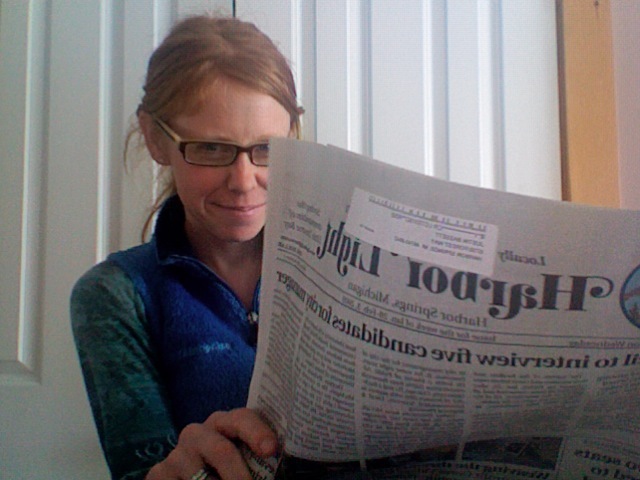 Have massive guilt about not reading anything but our local paper – and even that only every so often. Used to get the NYT for free, like that great apartment we once lived in in Chicago with free cable, but I am such an undying goodie two shoes that I called to cancel. Oh, that is so embarrassing. Worse than being the woman inside Chuck, really. I love small town papers. I always enjoy reading what makes the news. 🙂 Thanks for sharing a bit of your community with us. Awesome piece of writing … so glad I know something about Harbor … a remarkable place. Every setting has its own gifts and complaints … there’s no doubt in my mind, and that of Donna’s, that Habor, albeit small, is a unique community, a marvelous place that left a real mark in our lives, in spite of the brevity of our stay there. Thanks for sharing all of this with us. If you and the Spaulding clan have chosen HS as home, it has to be the place you described. And from my first weekend with you all a few years back, I knew it to be true even then. But you shouldn’t tell anyone…. Poor pig. Did he have an open casket. Oh my! But all in all, wrapped up perfectly. That community is why we’re here, in a very small town in Northern Ontario. If I were a high school student thinking about a career in journalism, I would have been mesmerized by your talk. You are entertaining, sweet and informative. I also live in a small town above the 45th parallel and absolutely adore it. Keep the writing coming.